BASSETERRE, ST. KITTS APRIL 18TH 2005 (CUOPM) - Traffic on the island’s main road between the Deep Water Port in Basseterre via the Bay Road and La Valle, just outside Sandy Point, was snarled for several hours on Sunday as the multi-million dollar golf course project awaited the arrival of its 40 ton electricity generator. 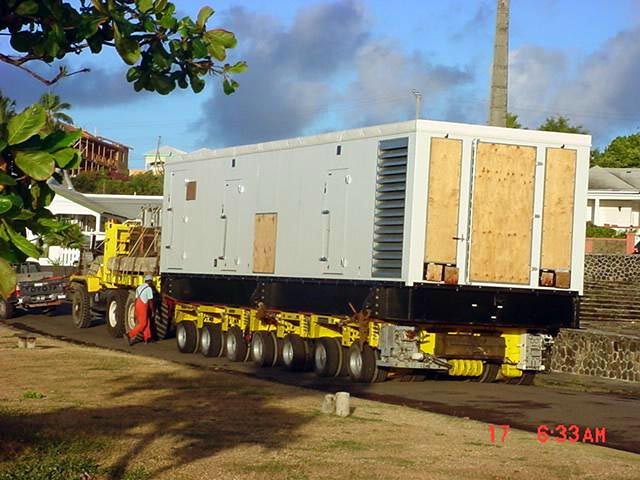 Under the supervision of the Head of the Traffic Department, newly-appointed Police Superintendent Stafford Liburd and Chief Electrical Engineer, Tony Bloom of Quality Engineering, the 2.5 megawatt diesel engine was transported on a specially designed trailer and truck brought in from neighbouring St. Maarten. Mr. Bloom said the generating set at the La Valle Development will be used to power the already installed desalination plant, the irrigation system and other infrastructure as the need arises. “It (the generator) has the capability of generating additional power capacity on the golf course development including the hotel, residential, shopping and other developmental plans,” Bloom told the Communications Unit of the Office of the Prime Minister (CUOPM). La Valle and Ross School of Veterinary Medicine Generators being moved to their respective locations. Officials from La Valle and Quality Engineering were assisted by St. Kitts Electricity Services technicians who cleared overhead power lines to facilitate the free flow of the heavy cargo along the near 10 mile route. An appeal was made all day Saturday for owners and drivers of vehicles not to park between the route on the island’s main road between Basseterre and La Valle, especially in areas where the road narrowed. The 18-hole La Valle International Championship Golf Course Development will have its own independent power supply. Workmen have just completed installation of the desalination plant. The first phase of the project will comprise the 18-hole Championship Golf Course, a practice facility, practice putting green, a club house, the power generating plant and desalination or reverse osmosis plant that will produce 1.3 million gallons of water for irrigation only. 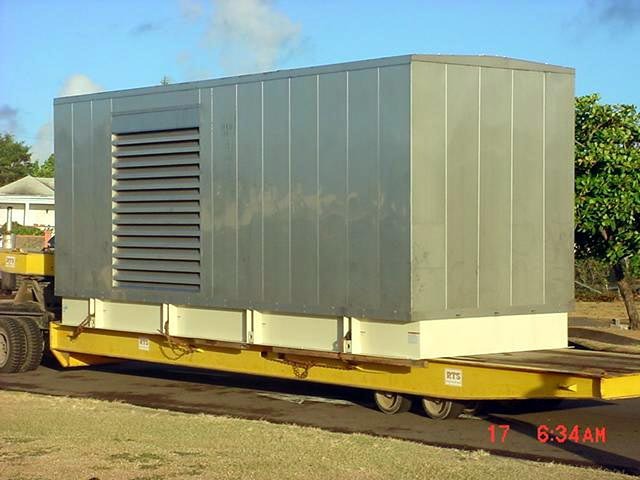 Ross University School of Veterinary Medicine used the opportunity of the La Valle operation to move a 1.5 megawatt generating set from the port to its site at West Farm.